The Icy RhinoBot is a RhinoBot with a blueprint skin applied. This RhinoBot, painted up for our loyal hunters, lets you hunt mice with sub-zero flare! Don't let the cute matching hat and scarf fool you, those frozen fists mean business! The Icy RhinoBot is not sold by any Trapsmith. It can only be crafted given the proper ingredients. RhinoBot – Source of RhinoBot Parts for crafting the Icy RhinoBot. 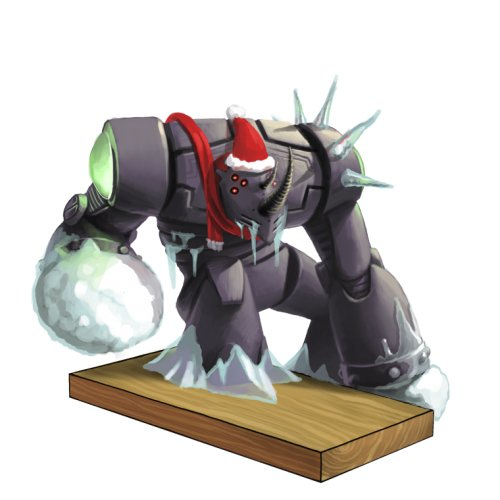 24 November 2010: The Icy RhinoBot was introduced as part of the Great Winter Hunt 2010 the skin was made available via Donations. Although no trapsmith has found a solvent powerful enough to remove a trap skin before, the scientists of Digby have been able to create a very small amount of magical solvent that will last for a limited time. This magical solvent will allow the Icy RhinoBot skin to be removed. We estimate the solvent will last around 2 weeks. All hunters who own an Icy Rhinobot have had their hunters hammers coated with the magical solvent. Once this magical solvent evaporates the Icy RhinoBot will no longer be smashable. 23 September 2011: The trap skin system was overhauled and the Icy RhinoBot Skin was changed to the Icy RhinoBot Blueprint. 29 July, 2015: The point requirement for the Icy RhinoBot was lowered from 16,000,000 to 4,000,000.